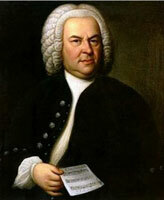 Johann Sebastian Bach, (born March 31, [March 21, O.S. ], 1685, Eisenach, Thuringia, Ernestine Saxon Duchies [Germany] – died July 28, 1750, Leipzig), a magnificent Baroque era composer, organist and violinist. He is now widely regarded as one of the greatest classical composers of all time and is celebrated as the creator of the Brandenburg Concertos, The Well-Tempered Clavier, the Mass in B Minor, and numerous other masterpieces of church and instrumental music. Johann Sebastian Bach was born in 1685 in Eisenach into a large and distinguished family of professional musicians, stretching back several generations. He was the eighth and youngest child of Johann Ambrosius Bach and Elisabeth Lämmerhirt. Johann received his earliest instruction from his father, who likely taught him violin and basic music theory. His father was the director of the local town musicians and all of his uncles were professional musicians (church organists, composers and court musicians). After his parents’ death in 1695, aged only 10, the young Bach moved to Ohrdruf, where he was brought up by his oldest Brother Johann Christoph. His brother was an organist at a local church, and he taught him how to play the clavichord. Living with his eldest brother also enabled Bach to gain access to sheet music, which he would pore over and copy for his own access. The young Bach did well at school. His studies included organ, harpsichord, and singing. In addition he took the academic studies in theology, history and geography, and lessons of Latin, Italian, and French. Because of his excellent singing voice, in 1700 Bach attained a position at the Michaelskirche monastery at Lüneburg. He was nearing his fifteenth birthday, an age when he usually began to earn his own living. On leaving school in 1703, Bach became a member of the orchestra employed by Johann Ernst, Duke of Weimar. After taking a short-lived post in Weimar as a violinist, in August 1703, 18-year-old Bach was appointed organist at the Neue Kirche in Arnstadt (1703-1707). Considering his age, and local standards, he was well paid; and his duties, as specified in his contract, were light. But, despite his musical talents, Bach would often come into conflict with his employer because Bach was interested in travelling around and concentrating on composing rather than other duties. Bach was frustrated at not having time to compose and having inadequate choirs to deal with. However, his growing reputation as organist enabled him to keep getting good offers. 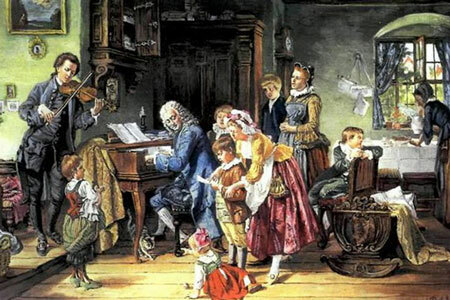 In June 1707, Bach took the position of an organist at the Church of St. Blasius in Mühlhausen and on October 17 he married his cousin Maria Barbara Bach. But soon left the obtained post since his musical style and the brilliant complexity of his compositions was neither appreciated nor accepted. Bach composed his famous Toccata and Fugue in D minor. He next took a post for the Duke of Sachsen-Weimar in 1708, serving as court organist and playing in the orchestra, eventually becoming its leader in 1714. In Weimar, Bach continued to play and compose for the organ, and to perform concert music with the Duke’s ensemble. He also began to write the preludes and fugues which were later assembled into his monumental work The Well-Tempered Clavier (Das Wohltemperierte Klavier). Bach stayed in Weimar for nine years, before leaving after deteriorating relationships with his employers. In 1717, Bach moved to Köthen where he enjoyed the patronage of Prince Leopold of Anhalt-Köthen. In 1720 his first wife Maria Barbara died and a year later in December 1721 Bach married Anna Magdalena Wilcke. She would bear 13 children, six of whom survived into adulthood. Perhaps the most famous pieces from Bach’s time as a court musician are his Brandenburg Concertos. These are a set of six works for orchestra, featuring dazzling instrumental solos. The opening of Bach’s Brandenburg Concerto no. 2 is a great example of the energetic music Bach wrote for his orchestra at Anhalt-Köthen. This piece also uses counterpoint, as a trumpet, violin, flute, and other instruments weave many jaunty melodies together. In 1723, Bach was appointed Cantor at the St. Thomas Church and School, and Director of Music for Leipzig, positions which he retained for the rest of his career. The job was a demanding one; he had to compose cantatas for the St. Thomas and St. Nicholas churches, conduct the choirs, oversee the musical activities of numerous municipal churches, and teach Latin in the St. Thomas choir school. He took on other projects, chief among which was the directorship of the city’s Collegium Musicum, an ensemble of professional and amateur musicians who gave weekly concerts, in 1729. Morning Prayers in the Family of Sebastian Bach. Painting by Toby E. Rosentahl, created many decades after Bach’s life. During the 1730s, Bach renewed his interest in keyboard compositions, and prepared the first three volumes of his Clavier-Übung (Keyboard Practice) for publication (1731, 1735, 1739); the fourth volume appeared in 1741-1742. In the 1730s, he also showed considerable interest in the royal court at Dresden, and was named Hofkomponist (Court-composer) in Dresden in 1736. In 1733, Bach composed, what is widely considered to be his greatest work – Mass in B Minor. Bach was a devout Lutheran Christian and his religious works are the most significant part of his canon. There is a rich religious devotion in his works, especially the Passions of Matthew and St John. Bach began making trips to Berlin in the 1740s, not least because his son Carl Philipp Emanuel served as a court musician there. In May 1747, the composer was warmly received by King Frederick II of Prussia, for whom he wrote the gloriously abstruse Musikalische Opfer (Musical Offering). Bach continued a lively interest in the building of organs, and kept informed about the latest developments in the construction of harpsichords and pianofortes. Johann Sebastian Bach died in 1750. He was not appreciated during his lifetime and was considered an “old-fashioned” composer. Today, Bach is considered to be one of the most influential composers of all time. In fact, he is now such an important composer that the year of his death is a defining point in music history. It marks the end of the Baroque Era.